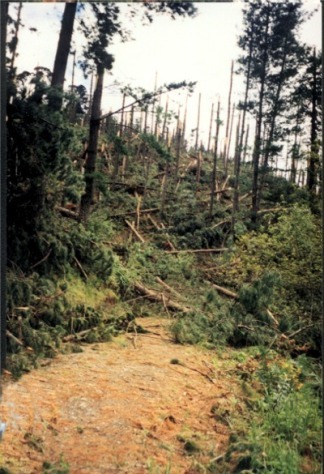 On the morning of December 15, 1998, Hogsback was struck by a tornado. 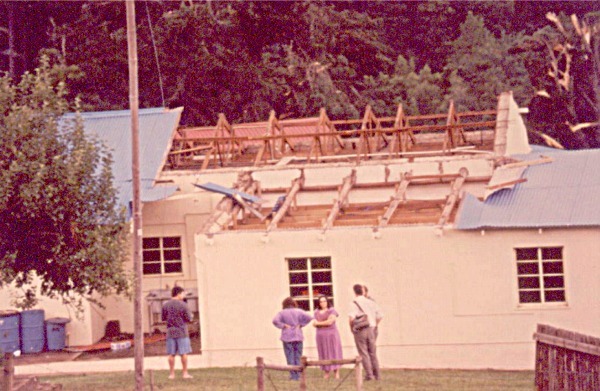 Several people were killed and buildings were damaged, including the Crab Bush Primary School and Hobbiton, an outdooor education camp for children. 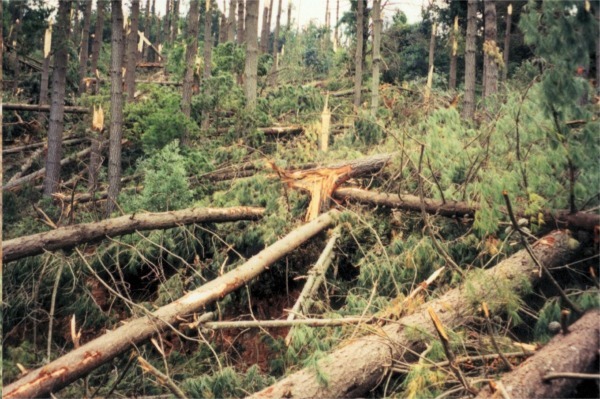 The tornado cut a swathe of destruction through the pine plantations, leaving it looking, as one Hogsback local remarked, as if a giant lawnmower had passed through. According to traditional Xhosa beliefs, the tornado takes the form of a giant winged snake, known as inkanyamba. This being lives in deep water and flies through the air, looking for its mate, which lives in a deep pool or dam. Mbuyiseli Jonas, one of the young men from the village of Hala, below the Hogsback, who sell clay models of various creatures in the Hogsback, says that it is generally the male inkanyamba who is searching for the female, "hence that strong wind. Maybe it's because of it's frenzy - I don't know whether it's mating season, or whatever!" People whose houses have unpainted zinc roofs are at risk, since inkanyamba will think that the shining metal surface is water, then will dive down and wreak havoc, as happened at Crab Bush Primary School, which has these type of roofs. Although the roofs at Hobbiton were painted, they were blue - an unfortunate colour choice. After the 1998 tornado, the young men who sell clay models began making clay tornadoes. At that point, members of this grouping included Zithobile Mona, Sandile Nqweniso and his brother Tam, Nash (Tembani) Xwembe, Wowo Mzinyati, Mbuyiseli Jonas and Lennox Dlala. The tornadoes were fantastical, dragon-like creatures, often with fangs, horns, wings and fishes' tails, the latter calling to mind the inkanyamba's association with water. These models are, however, not based on any traditional descriptions of this being. As many of the modellers said, inkanyamba is invisible and no-one has ever seen it. Instead, the inspiration for their models comes from pictures of dragons and dinosaurs they have seen, such as the image of a dragon on a notice board that used to be outside Hobbiton. Many of the elders in local Xhosa communities, such as Wilson Mafika, were brought up to regard the inkanyamba as an extremely dangerous, destructive presence that needed to be treated with great respect and caution at all times. As a child, he relates, they were not even allowed to use the word inkanyamba, for the inkanyamba might hear its name and come. Despite the fact that they sell model tornadoes and tell potential buyers about inkanyamba, in the hope that this will attract their interest, the modellers themselves refer to their creations as tornadoes, not inkanyamba, and generally avoid using the winged serpent-like shape. Instead, their tornadoes are more reminiscent of western dragons. Possibly the modellers themselves may choose to preserve a certain distance from the inkanyamba itself, with all its terrifying, perilous associations. Yet, their creations serve to remind Hogsback residents and visitors that the inkanyamba has struck Hogsback in the past and may well pass through it again. All of us who live in this mountaintop community are at the mercy of many forces far greater than we are, such as storms, fire and snow. But the most powerful of all these is the inkanyamba.